If you were to take several of the quarter or nickel-size round stones on the beach at Antelope Island, as I once did, and stand them or stack them in the sand so that the sun caused them to cast long shadows, then photograph them up close without surrounding reference objects, one might interpret the objects in the resulting photograph as gigantic rock formations. As Jun Kaneko reminds us at the entrance to his current exhibit at the Salt Lake Art Center, a sense of scale derives from the relationship of objects in their surroundings. His work is about scale – whether it’s the relationship of geometric forms to a background on a large piece of rice paper, or the relationship of human observers standing next to ceramic heads the size of small cars. 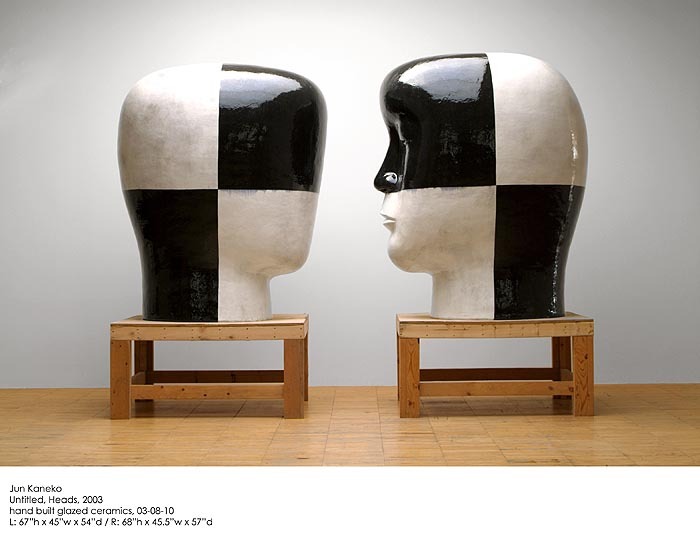 Jun Kaneko was born in Nayoya, Japan in 1942. In 1964 he came to the United States to study ceramics, first at the Chouinard Art Institute in Los Angeles, and later at the California Insititute of Arts and University of California-Berkeley. Kaneko now has US citizenship works in Nebraska.He is a respected and highly influential artist in the realm of ceramics and design. He is known in Salt Lake for the “Salt Palace Wall”, made of hundreds of hand-made ceramic tiles, located in the primary corridor of the Salt Palace Convention Center. The Street Level Gallery features several of Kaneko’s ink drawings on handmade paper and the Main Gallery features many ceramic objects as well as site-specific intallations. I did not find the rice paper paintings nearly as interesting as the ceramics, except as a fuller representation of Kaneko’s work and a good lesson to any working artist that experimentation in various media enriches our work in our favorite medium. But looking down into the Center’s lower gallery from the walkway above, I was impressed with an overview of two large black and white glazed ceramic heads, a large bronze head with grommet-like appendages, tall Lincoln-log-like structures of colored glass bars, two large three-dimensional-looking paintings, and the large wall of ceramic squares. The paintings were another surprise at eye level. From a dozen feet away, they appeared three-dimensional. I expect to see/feel a washboard of peaks and valleys in the varied colored horizontal lines. But on closer inspection, I find that while the paint is a bit thick on the canvas, the dimension is mostly illusion. Further, the horizontal stripes are layered over an underpainting of shapes that make little impression up close, but create a more recognizable composition from further away. The quilt-like, though less predictable, ceramic square installation on one wall is my favorite piece. There is something comforting in the repeating, geometric patterns, with circles spanning four squares. Yet the less symmetrical arrangement of the patterns captures and holds your attention. 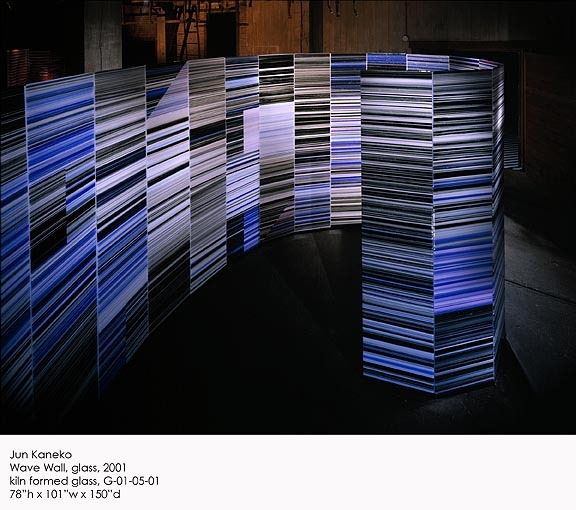 Once again, the attraction was largely due to Kaneko’s attention to scale and the observer’s interaction with the piece from far away to up close. An adjacent gallery space holds Kaneko’s “Wave Wall,” a curving expanse of fused glass about seven feet tall. The exhibit program offers a view of the piece from up high allowing you to see the spiral. I wonder why the Art Center didn’t place the piece in the other space where visitors could see it from that perspective? The ground level experience of walking around the spiral to the center of the “wave,” while interesting, could have been enhanced by a view from above. The Salt Lake Art Center’s mission statement says it “is responsible for challenging and educating the community about contemporary visual art and for developing a strong mutual trust with it.” This exhibit is an excellent opportunity for members of the community to be challenged and educated. This article originally appeared in the December 2005 edition of 15 Bytes.